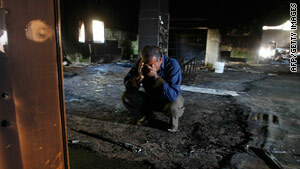 A Palestinian man crouches inside a burned-out mosque in the northern West Bank. Jerusalem (CNN) -- Palestinian officials blamed Israeli settlers for a fire that damaged a mosque in the northern West Bank Tuesday morning, while Israeli officials suggested the blaze may have been accidental. Ghassan Douglass, a Palestinian Authority official charged with monitoring settlement activity in the Northern West Bank, told CNN that the mosque in the Palestinian village of Libban Al-Sharqqia was set on fire at 3 a.m. by unidentified suspects. He said residents of the area reported seeing unidentified vehicles in the area at the time of the blaze and later the vehicles departed the scene. Douglass told CNN he believed the fire was started by Israeli settlers from one of four nearby settlements, based on recent activity in the area. The Palestinian Authority-run WAFA news agency reported that President Mahmoud Abbas condemned the mosque fire, blaming it on "extremist settlers." Abbas called it a "criminal act" that represented "a threat to the efforts of reviving the peace process." An Israeli military spokesman said the event was still being investigated in cooperation with Palestinian and Israeli police, but he said initial indications were that the fire may have been electrical in nature. Palestinian officials who investigated the scene of the fire told CNN they had concluded that it had been started intentionally and was not the result of an electrical fire. The fire comes amid a number of recent incidents in which settlers have been blamed by Palestinians for exacting what are known as "price tag" attacks. The term is an expression used by radical Israeli settlers to denote reprisal attacks against Palestinians in response to moves by the Israeli government to evacuate illegal West Bank outposts. It also comes as the United States' special envoy to the Middle East, George Mitchell, arrived in Jerusalem Monday to prepare for the expected start of proximity talks between Palestinians and Israelis. Last month a mosque near the West Bank city of Nablus was vandalized with Hebrew graffiti and two nearby cars set ablaze. Some 300,000 Israelis live in West Bank settlements on land seized from Jordan in the 1967 war. Israeli settlements are one of the primary sources of tension in the decades old Israeli-Palestinian conflict with each side asserting historical rights to the land.